In a medium hot Morso Forno, we sweated a large leek (finely sliced) in 2 tablespoons of olive oil in a Morso frying pan. When the leek was soft, we added 300g parboiled and sliced new potatoes, 2 tablespoons chopped fresh herbs (a mix of parsley and chives) and a good pinch of salt and pepper. When the potatoes were hot and cooked right through, we whisked up 6 free range eggs and added them to the pan. They cooked gently until they were almost set and then we added a handful of grated mature Cheddar cheese. 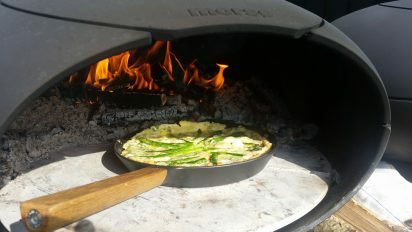 We added a few small sticks of wood to the fire to create some flames for grilling the cheese and then the frittata was finished. We serve this at home for breakfast, brunch or lunch and take it on picnics too. Great with a green salad and some good bread. 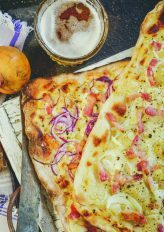 One of our favourite flatbreads from our latest book Woodfired Flatbreads & Pancakes. Make a dough out of 250g 00 flour, 5g salt and 3g dried yeast and add 180g warm water. Knead this altogether until smooth and elastic and leave covered to rise until doubled in size. Shape the dough into 2 x 30cm squares and spread with creme fraiche. Sprinkle with ground black pepper, thinly sliced onions and smoked bacon lardons. Put the flammkuchen one at a time into the hot Morso Forno. Make sure the oven floor is good and hot before pushing the fire to one side and cleaning the floor by blowing away any ashes with a blow pipe. The flammkuchen will bake quickly in around 3-4 minutes; you’ll probably have to turn it around in the oven first to get an even bake. Chop them up with a sharp knife and serve warm. Delicious! We bought a couple of lamb rumps from our butcher and cooked them in the hot Morso Forno. They’d been rubbed in a little olive oil and seasoning to start with and we heated up the griddle pan before adding the meat skin side down. Lamb rumps are basically little joints so we cooked them for around 12 minutes until they were medium rare and left them to rest. While the lamb was cooking we heated up the Morso frying pan and added some parboiled sliced new potatoes with some more olive oil to sauté until golden brown and crisp. Slice the lamb thinly and serve with the crunchy potatoes and a rosemary and apple jelly. And last but not least, our Thai fish cakes. Whizz up 400g fish fillet (no bones or skin) in a food processor until smooth. We used salmon and mackerel but any fish is fine. Then mix in the juice of a lime, 1 tablespoon of Thai fish sauce, 2 tablespoons chopped fresh coriander, 4 finely sliced spring onions and 100g finely slice green beans. If the mixture looks a little wet, add a tablespoon or so of rice flour to absorb the moisture. Shape into fish cakes about 3cm wide and 1.5cm deep and put on a tray. Cover with clingfilm and chill in the fridge until you want to cook them. Heat the Morso up until it’s good and hot with a fire burning to the side. Heat up the Morso frying pan and then add 3 tablespoons sunflower oil. Add the fish cakes in batches and cook until golden brown and crispy on each side, flipping them over half way through. Serve hot with a chilli dipping sauce and an extra squeeze of lime juice. Hopefully this has jogged your memories about what we cooked on the night if you were there too and has given you some ideas of what to cook. 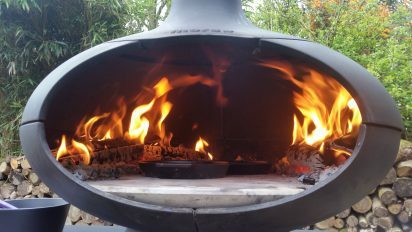 We’ve had great fun cooking lots of different things in the Morso Forno and Grill – best thing is to fire it up and get cooking!! It’s difficult to give temperatures and we talked about developing a feeling for the oven and what temperature it is at – more explanation about that on this blog post from last year. 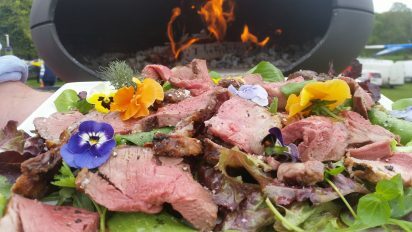 We’re running some Morso woodfired courses here at the cooking school in Kingswear so if you’d like to come let us know!